You are here: Home » MEDIA » Books » Burn by James Patrick Kelly (ebook review). 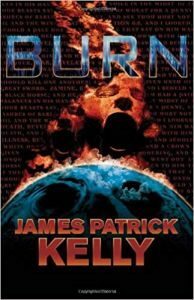 Burn by James Patrick Kelly (ebook review). I was initially unsure why we were sent this novella by James Patrick Kelly to review as its been out for quite some time now. It was first published in hardback format in November 2005 and was a Nebula Award winner. A little bit of digging uncovered that the people at Tachyon Publications are now offering it as a digital download. I’m glad they are as I didn’t read ‘Burn’ the first time round and this gave me an opportunity to read it on my ebook reader. ‘Burn’ is a futuristic take on the classic book ‘Walden’ by Henry David Thoreau which was published in 1854. You don’t need to have read ‘Walden’ or indeed know anything about it to enjoy ‘Burn’, though. In case you haven’t read it, ‘Walden’ is the thoughts of someone (Thoreau) who set out to live simply in the countryside for a couple of years. It has been described as part-memoir and part-spiritual quest. Dragging ourselves back to the rather more modern ‘Burn, this SF tale takes place on the planet Walden. The planet is an eccentric billionaire Jack Winter’s eco-plaything. He’s bought it from the previous owner after it had been stripped of most of its natural resources. In an age of augmented and diversified humans, he wanted to create a spiritual home for ordinary people who wanted to live a simple life. Any would-be-colonists have to give up modern technology and revert back to a more basic, simple lifestyle. There’s more than a hint of Amish here. The rest of modern humanity (Upsiders as the Walden inhabitants call them) maintain a voluntary cultural embargo on the planet in deference to the colonists wishes. The only fly-in-the-ointment here are the original inhabitants or to put it another way the leftovers from the previous owner of Walden. They are known as the pukpuks and were granted leave to stay on the planet but haven’t signed up for the simplistic lifestyle. They aren’t happy about Jack Winter’s tree planting neither. The trees are part of Jack Winter’s plan to restore the ecology so they are rather virulent, quickly encroaching on the desolate plains. Unfortunately, the original inhabitants quite like the open plains and fight back in the only way they can, by setting forest fires. They also have some sympathisers amongst the colonist’s offspring. The central character is Prosper Gregory Leung, the son of an orchard owner and volunteer fireman. A believer in the simple lifestyle and Winter’s vision for Walden he’s been badly injured while fighting a forest fire. It’s during his recuperation in Hospital that Leung starts to realise what he’s been missing out on. The hospital is very modern and very technical. The doctor works through an avatar as he’s located on another planet. Where things really start to go off the rails is when Leung starts contacting people on other planets using the Hospitals Tele system, a sort of a video phone. He inadvertently makes contact with the High Gregory of Kenning who, while a youth, is the leader of the L’ung. After this initial contact, the High Gregory decides to break the cultural embargo and pay him a visit. He also takes his rather large entourage and a highly sophisticated flying machine. What follows is a tale of contrasting environmental, social and cultural viewpoints. It’s rather well done and the author has obviously spent quite a bit of time researching forest fires and how the fire teams respond to them. Prosper Gregory Leung has some hard choices to make providing he can survive the next forest fire. There’s a good section following the story where Kelly describes how he came to write ‘Burn’. Prior to this he had been specialising in short stories and it does show in ‘Burn’. The book could do to be quite a bit longer as there is a lot of areas which aren’t fleshed out as much as they should be. The L’ung and particularly High Gregory remain an enigma as do the original inhabitants of Walden. There’s also a brief mention of some of the indigenous Walden wildlife and which also sounds interesting and I wanted to know more about them. Now I’ve got my rant over with, let me say I enjoyed reading ‘Burn’. It’s a bit different which gives it a fresh appeal. I do think it’s a bit short but don’t let that put you off as it’s still a very good read. If you pop over to https://tachyonpublications.com/product/burn/ you can pick up a copy in a format of your choosing. Prices start from $ 7.99 for a format suitable for your ebook reader and $19.95 for a hardback version. Thoreau’s book is entitled ‘Walden’… and the planet in the book is also Walden. Indeed it is Julian. I think I say that in the review but not as succinctly as you. Have you read Burn? I really do recommend it but I’m always keen to hear other peoples opinion of it. « Star Wars: From A Certain Point Of View, by various (book review).